Sustainable blue fin tuna, cucumber, ponzu-sesame sauce - I normally don't touch blue fin tuna as it's not sustainable, but here it's labeled "sustainable"... so I figured what the heck. Came with avocado, orange, red onions, and sesame. Unfortunately the sauce was too salty for me. Organic 100% grass fed steak tartare, pickled egg yolk, 15 secret ingredients - "organic" and "grass-fed" are two buzzwords that are likely to push people's buttons, so I promptly ordered it up. Unfortunately I found the flavors to be a little bland... as in the beef itself. The combination of 15 secret ingredients also produced a lighter result. The horseradish was very, very light - both in terms of the kick and also the airy texture. Loved the idea of incorporating salmon roe. Italian beef heart tomato, avocado, coriander, lime - this was alright and nothing special. Fresh burrata, tomato, cherry, black sesame, lavender - this was very, very creamy. pretty nice. Chicken empanada, spicy pico de gallo - it's been a while since I last had empanadas, and these were very fluffy and crunchy on the outside. Pretty yummy, with what seemed to be soy beans giving some crunchy texture. 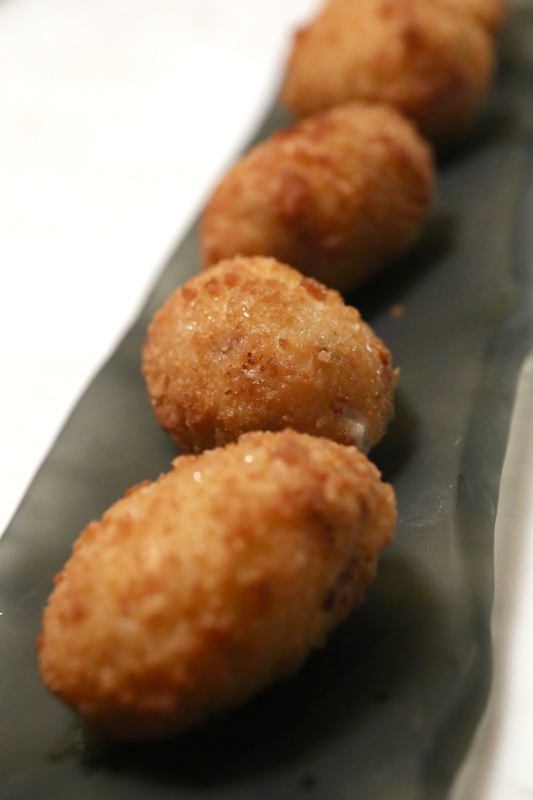 Croquette, jamón, scallions - absolutely no complaints here... creamy, savory center. Spanish octopus, puffed pork skin, potato foam, smoked paprika - the octopus was nice and smoky, with yummy potato foam on the bottom. 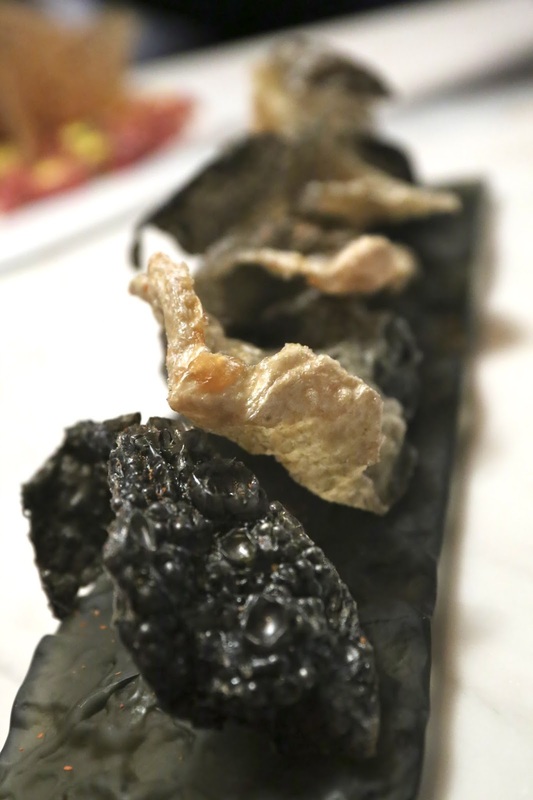 What seemed to be rice crispies on top were actually bits of puffed pork rind. Very, very good. Baked angel hair pasta, seaweed, roasted garlic aioli, cooked in prawn jus - another dish that was highly anticipated. I had had something similar at On Lot 10 a while ago, and loved the way these things are done. What's not to love about some noodles soaking up tons of umami flavors from prawn jus? The aioli always matches well, and love the seaweed. Lamb short ribs, romesco, padron green peppers - I really, really loved these lamb short ribs. The flavors were very lamby, and they were dry and crispy. Really satisfying both in terms of flavors and texture. The romesco sauce was nice, too. They ran out of padrón peppers today, hence we were seeing red. One complaint I had was that when the dish arrived, one of the pieces fell off the plate onto the table. I was surprised that our waitress didn't bother doing anything about it, so I pointed it out to my friends. At this point the waitress came back, picked it up and took it away. We fully expected to be made whole by the kitchen, but a replacement never came. Ginger sorbet, white chocolate and yogurt ganache, passion fruit - I thought this was a pretty pleasant dessert, and certainly very floral in terms of flavors. Caramelized Catalan cream foam, vanilla ice cream, orange, honeycomb - I really did love this dessert, since I love crema catalana. This has the added benefit of citrus fragrance and the crunch of honeycomb bits. 2003 Penfolds Yattarna - buttery, a little vanilla, oaky, and lemon notes. Acidity was a little higher than expected. Needs time to open up. 2006 Liger-Belair Vosne-Romanée Clos du Château - really sweet and fruity nose, wow! Amazing! So sweet it was like overripe honeydew melon, with floral notes like rose. Some dried herbs, too. Palate was a little thin and acidic.